Jumping into any new sport or hobby can be not only daunting, but downright confusing. If you’ve never rowed or paddled before, your first time nestled within the bowels of a kayak may leave you feeling like a fish out of water. Especially if you haven’t yet recieved any kayaking tips. 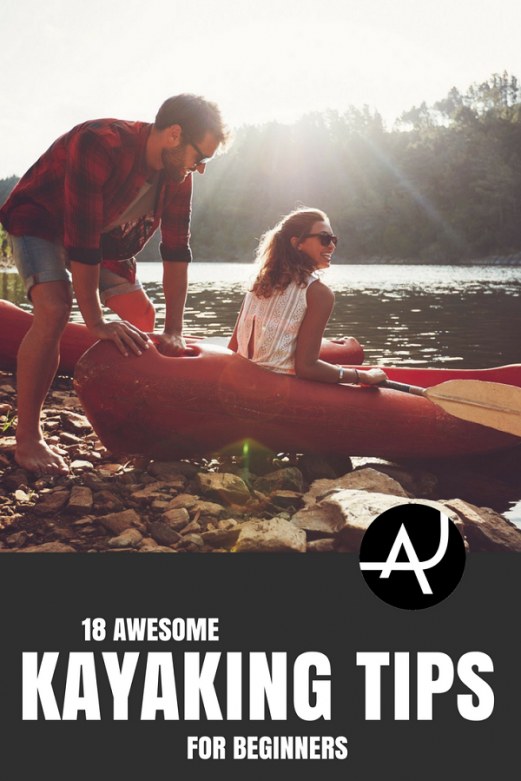 Here at The Adventure Junkies, we pride ourselves on providing you with the tips and know-how on how to experience your favorites outdoor actives in the best ways possible. 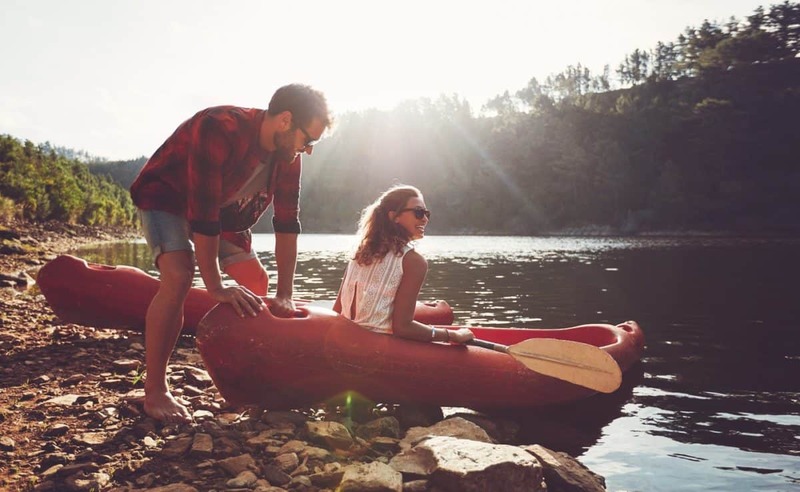 Whether or not you’re looking to take on class-four rapids or just paddle through a glass-smooth lake, there are some key kayaking tips you should take into account before pushing off the shoreline. 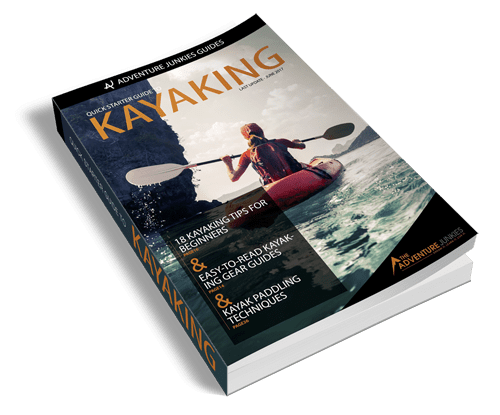 In this guide, we’ll go over everything from paddling techniques and stretching, to equipment care and proper attire. 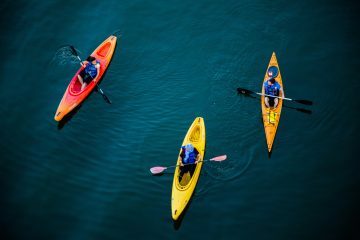 Follow these rules, and you’ll get the maximum benefits provided by kayaking. Regardless of whether it’s a cold near-winter morning or a hot mid-summer afternoon, dress for the water. For example, if you’d normally wear a wetsuit in those waters, wear one kayaking. If it’s more board shorts appropriate water, a well-fitting swimsuit will suffice. There’s nothing that can ruin your kayaking adventure more than coming back to find your expensive smartphone is now water damaged. While press-and-seal storage container will work just fine for your food and wallet, we’d recommend investing in something more sturdy to store your electronics and clothing. These dry-bags from REI are highly recommended. If you’re going down white waters, we’d highly suggest you touch-up on rapid safety practices from Raft Masters. A quick flip of your kayak can suddenly put you in a life-or-death situation. And every decision counts. 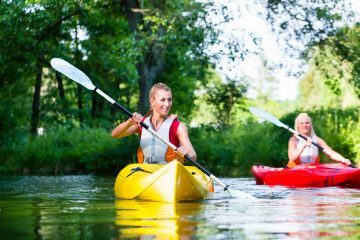 Get a feel for kayaking first before investing in any equipment, if you can. 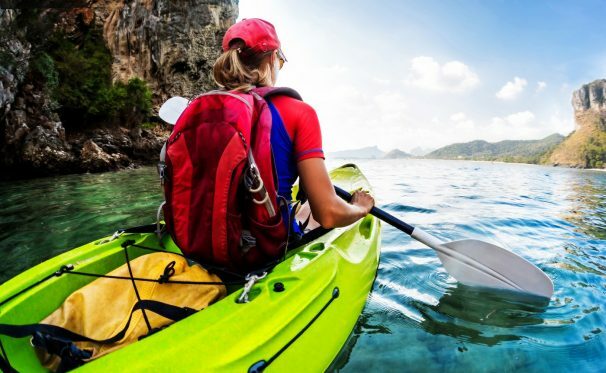 Kayak renting services have become more and more popular in the past decade. Be sure you to also rent helmets and life vests in addition to the kayak and paddles. There’s actually a series of hand signals and gestures that help kayakers communicate with each other. After all, rapids can be quite noisy and distracting. 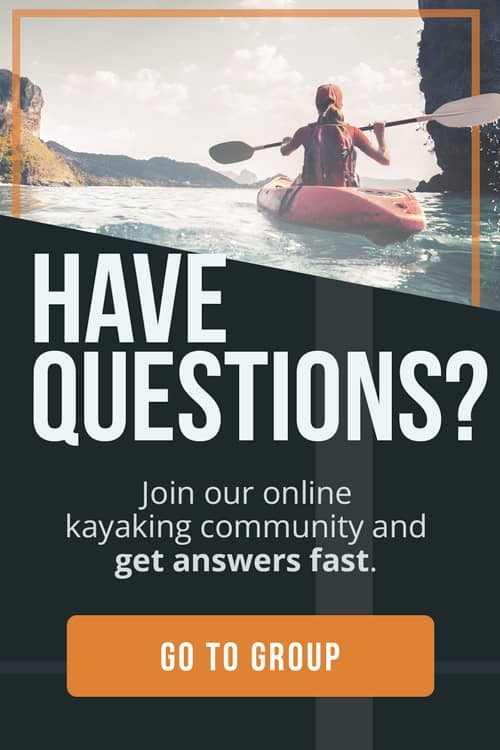 If you’re kayaking in a group, it may be helpful to brush up on these simple signals, like these as found at Paddling.com. We recommend getting a feel for how you paddle-stroke before hitting the water. Simply straddle an armless chair while holding a broomstick or hockey stick, and imagine yourself paddling from side to side. Depending on how you hold paddle and stroke will determine your style. For more information, watch the video below. Like we’ve touched on before, you should either leave your electronics on dry land or sealed in a dry-bag. 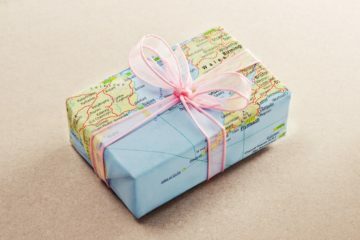 Print-out or check-in with a visitor center for any maps or guidebooks on the area they may have available. Kayaking through a lite drizzle won’t raise too much of a problem. But trying to paddle through a heavy rain will fill your kayak’s cockpit with water and render it unstable. Make sure to check all weather conditions where you’re kayaking before heading out. Also, take not that heavy rains from a day or two prior will make for more turbulent waters too. You really should never leave home without it. Having a role of the versatile adhesive on hand can come in handy in a pinch. Has the shaft of the rod cracked? Tap it up. Want to secure gear from rolling around your kayak seat? Secure it. While sitting with your back supported in the kayak, place the balls of your feet in the foot guides. Some kayaks have pegs, instead. Your toes should be pointed outward and your heels should be found in the center of the kayak. The knees should have an upward and outward bend to them allowing the legs to contact and apply pressure to the thigh braces. Don’t be a rabbit right out of the dock. 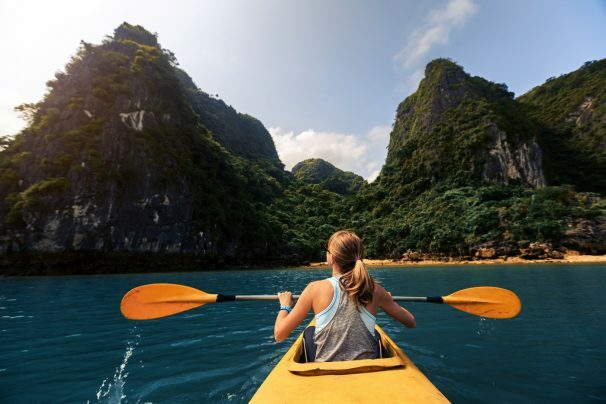 Enjoy the scenery, get a feel for how your body rests in the kayak and how you paddle through the water. Focus on technique, not speed. The turtle wins in the end, after all. Rocks and animals can seemingly pop-out of nowhere. Kayaking is no time for your favorite playlist. Take advantage of being outside, and enjoy nature’s playlist. Like we’ve said before, if you’re traveling in a group, it’s best for everyone to stay in contact with one another. Especially if you’re traveling down any white waters. The general rule of thumb is no one should be further than earshot from each other. If you’ve ever experienced a spin while driving, you know exactly what we’re talking about. Don’t fight the vessel, go with it. If you spin your kayak, follow through with the motion and adjust accordingly. Use the kayak’s kinetic energy to your advantage. There are few places better to wildlife watch than from the seat of a kayak. Bringing a pair of light, durable binoculars will only enhance that. Look for water-resistant and portable binoculars—See our article all about binoculars. Scratch resistant lenses are ideal. Odds are, you’ve been sitting in one upright position for an hour or two. Maybe even more. And now you’re body is quite tight and settled in that position. To avoid cramps and aches throughout the rest of the day, do some light stretching. It’s also beneficial to do these before kayaking, as well. We’d recommend doing the ones found in this video below. One of the cardinal rules of any water sport is to never pack gear or clothing while it’s wet. If you do, mold, rust, and other unwanted surprises will be quick to follow. If you’re in a rush and can’t spare the time, leave the damp packed gear uncovered. Before stepping into your car and heading off into the sunset (or sunrise), check your gear. Be sure you haven’t caused any accidental dings, holes, tears, you name it. Also, pay special attention to your paddle and kayak seat. Then, after that, do it all again.